In the past we’ve gone out to a nice dinner on New Year’s Eve but in the last few years we’ve decided to stay in and do our own thing. (I used to go out dancing for NYE with friends–my favorite thing was the Michael Jackson vs. Prince dance party at various clubs in town!) This year we decided to have a little dinner party with another couple and play board games. 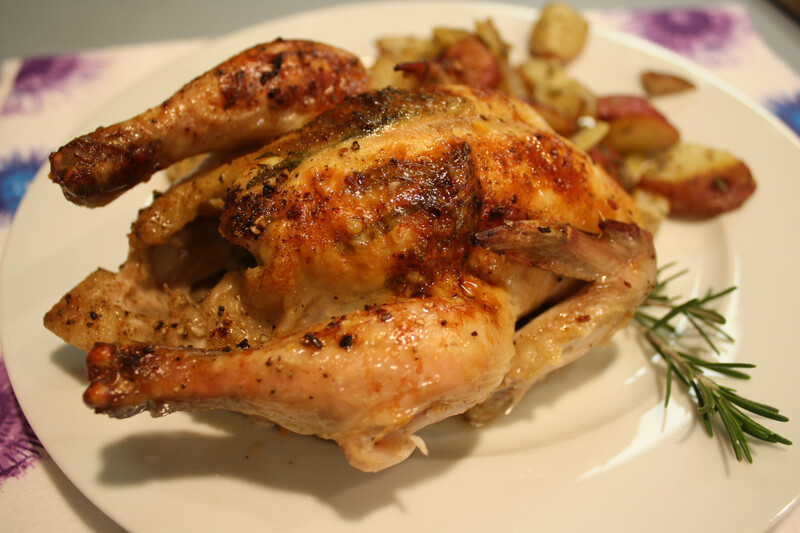 For dinner we made Cornish Game Hens. I’ve done them before but it’s been awhile. I looked around for a recipe that sounded good (last time I did them I just used some butter, seasoning and herbs) and we got to cooking. 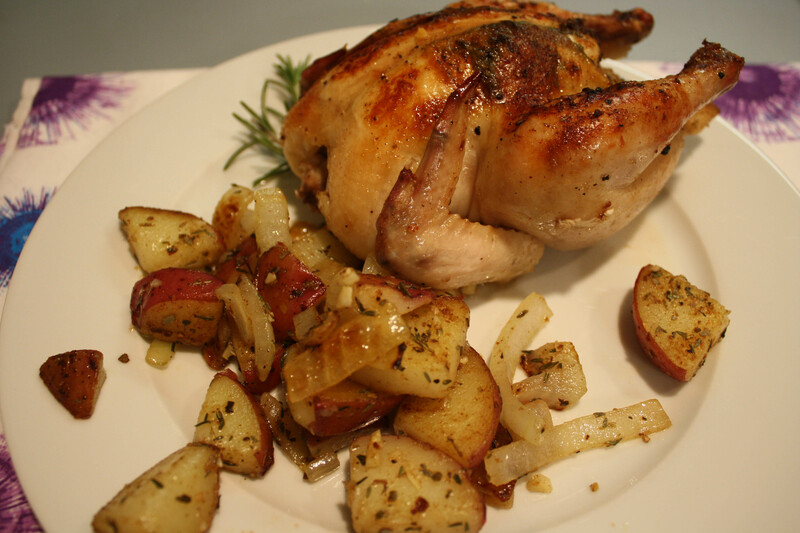 I looked for a few different hen recipes and found this one that was great. I didn’t have a traditional roasting pan but thankfully Google solved that for me and I made a “roasting” tray in the Le Creuset pan with foil. This recipe was super easy to follow and it didn’t take too long. The hens we got didn’t have the giblets in them, so it was a lot easier to clean them. Pat the hens dry with a paper towel. Use your index finger to loosen the skin on the top of the hen and slip a thin slice of butter under the skin on top of each breast. Add a few rosemary and thyme leaves (or herb of choice). Repeat for each hen. Put a quarter of a lemon in the cavity of each hen along with a clove of garlic and a sprig of fresh rosemary and thyme (or herb of choice). Truss the hens by tying the wings and legs. Rub each hen all over with some extra virgin olive oil, then sprinkle with salt and freshly ground black pepper. Place then hens on the rack of a roasting pan lined with aluminum foil, spacing them out so they are as far apart from each other as possible. This will enable their skins to get browned and crispy. 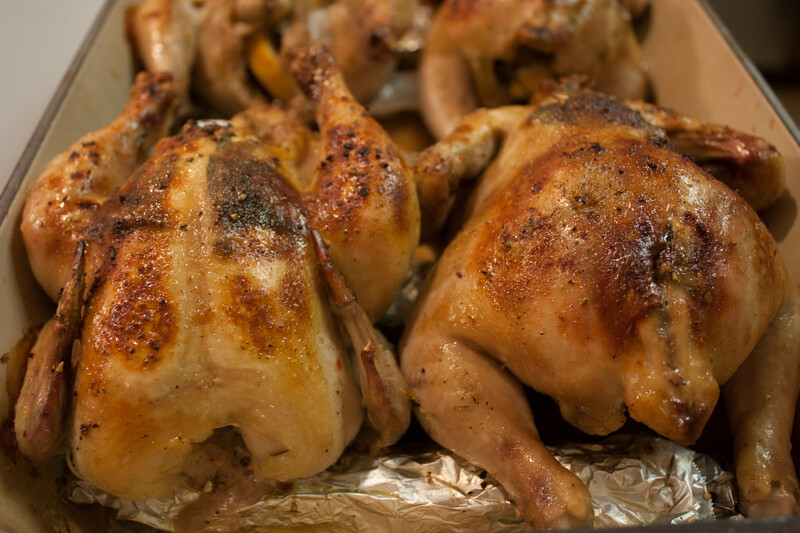 After the hens have been roasting for 35 minutes, reduce the oven temperature to 350 degrees F. Pour the broth/wine mixture over the hens and continue to roast for 30 minutes, basting the hens with the juices at the bottom of the pan every 10 minutes or less. The hens are done when an instant-read thermometer inserted into the thickest part of the thigh registers 165 degrees F and the juices run clear. If you prefer darker skins, turn up the temperature to broil for a couple more minutes, watching closely to prevent burning. Carefully remove the hens and pour the juices from their cavities into the roasting pan. Transfer the hens to a warmed platter, remove the trussing string, and tent with aluminum foil to week warm. Pour the juices from the roasting pan into a saucepan and boil for about 5 minutes until the liquid is a thin sauce-like consistency. Serve the hens whole per guest or cut in half lengthwise and place cavity-down on each serving plate. Drizzle the sauce over the hens and garnish with fresh herb sprigs and a slice of lemon. Serve immediately. I used fresh rosemary from the garden and lots of garlic. Some of the reviewers of the recipe said the minced garlic burned. I decided to use slivers instead of minced. I also used a lot more garlic than the recipe called for and honestly, I’d use more next time. I would also flip the birds over half way through so that they get crispy brown on both sides. Our friends arrived just as the birds were done. Michael cooked up some small red potatoes with onions, garlic and herbs. It went great with the chickens. I considered making a salad but it seemed liked a lot of food so I skipped it. Also, the hens looked really big but once you started eating them, it wasn’t as much food as it looks. The bulk of it was the bones and stuff. The meat was really juicy and mild in flavor. I’d use more garlic and a little more salt next time I make these. Everyone seemed to like the dinner, so I was happy! Our friends, Brian and Courtney, made flourless peanut butter cookies for dessert and they were delicious! I need to get that recipe. 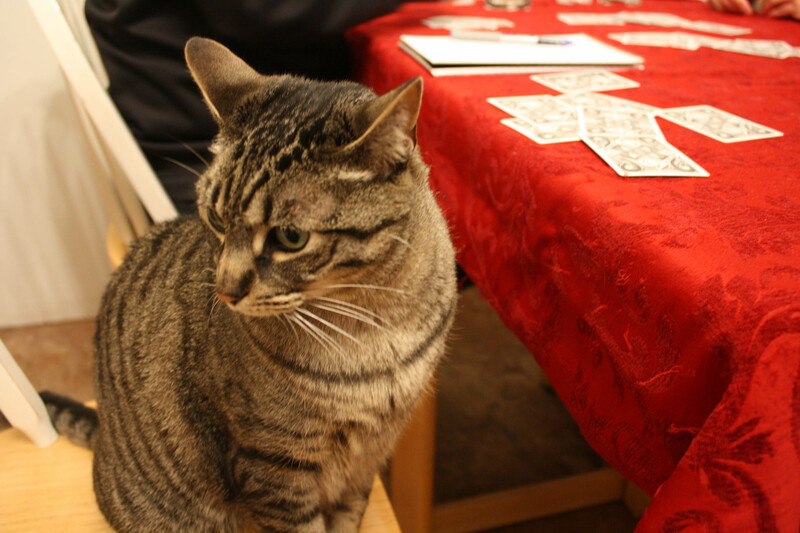 We got some new games for Christmas: Settlers of Cattan, Ticket to Ride, and Bunco. I was super excited to try them out. I ordered Ticket to Ride on Amazon and with Prime it should have arrived long before NYE but sadly, it did not. (I contacted Amazon and they were great about it, gave us an extra month of free Prime, but I was still disappointed the game didn’t arrive because that was the plan for the dinner party.) 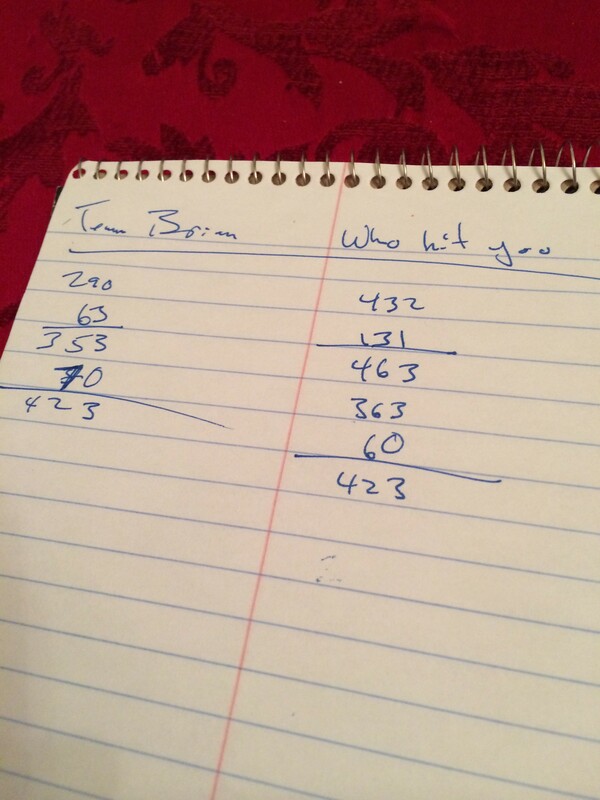 In the end, we ended up playing a card game instead, Spades, but it was super fun! I love that game and often play it on my phone when I’m watching TV. 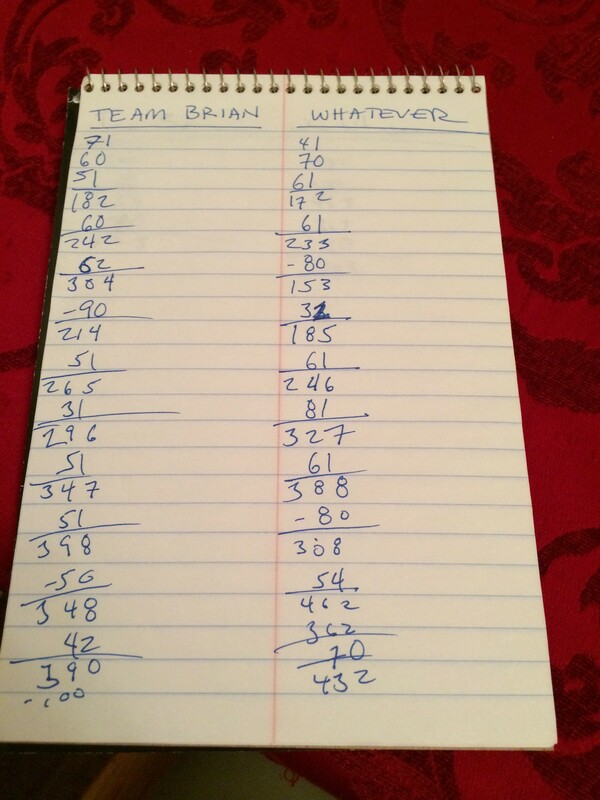 It was Brian and me against Michael and Courtney and when we called it a night our teams were tied! It was really fun. 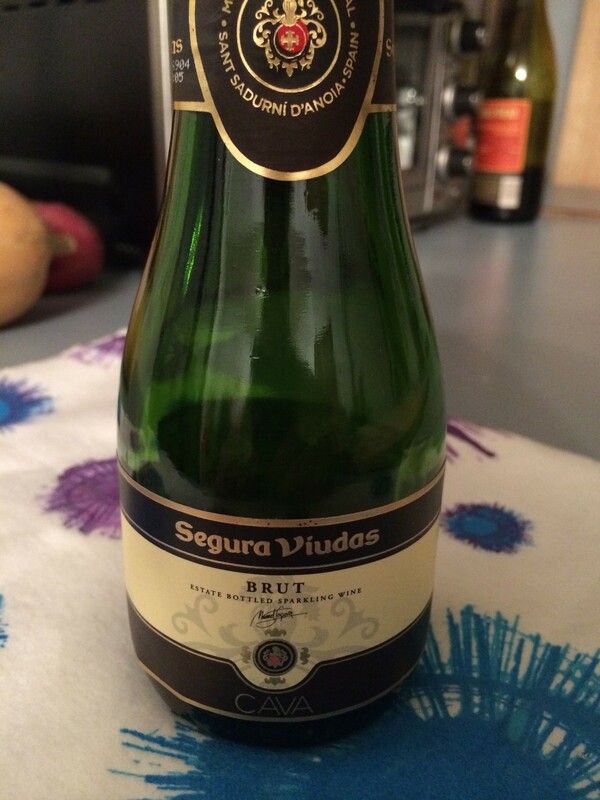 We had a white wine blend with dinner and I opened a small bottle of champagne (it was actually the other mini bottle of champagne that the hotel gave us on our wedding night–it took us that long to finally drink it). We didn’t make it til midnight to ring in the new year, which would have been nice but at the same time I was also happy to go to bed at a decent hour! Dang, we got old. It was a fun, easy going night and I love playing games so that was a great time, too. It also felt amazing to sleep in super late on New Year’s Day! Hope you had a great New Year! I’ve done a whole chicken before and it was super easy and delicious. I was intimidated for a long time, too. Give it a try! Too bad Ticket to Ride didn’t arrive in time – I LOVE that game! We used to have family game nights on Sundays when the kids were younger, but now that they are off to college, we need to find friends who are interested in playing games. We’re getting old, too – we were in bed by 10:30 on NYE – perfect! The game finally arrived over the weekend and we got a chance to play. SO MUCH FUN! Love it! Your hens looks tasty. 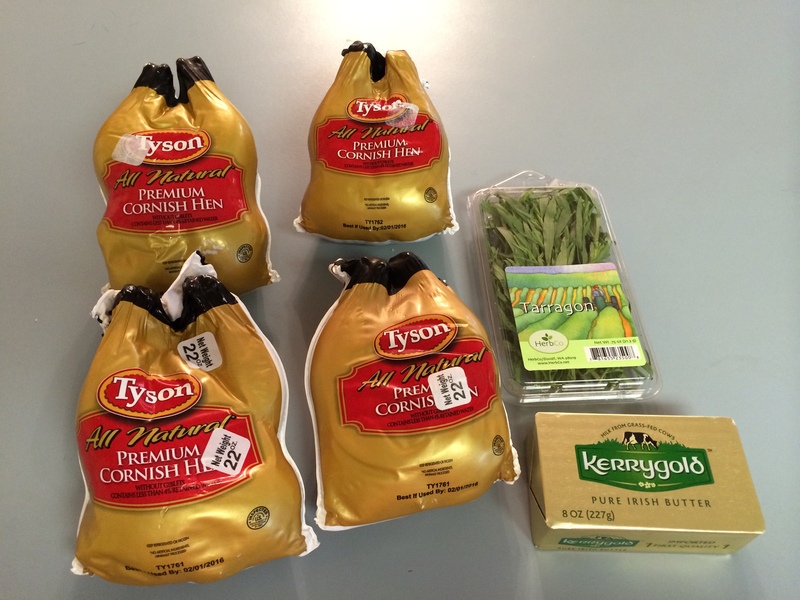 I made cornish hens for Christmas dinner – first time ever!! I actually found a crock pot recipe – good stuff. My New Years consisted of burgers and Cards Against Humanity with my friend and her fiancé. After midnight I tried to go to bed but everyone else wanted to stay up so I lay on the couch and stayed conscious enough to play the game. Oooh that sounds fun! I love that game. Perfect way to celebrate the holiday. I’ve had to work so many New Years Eve, I never usually want to go out – too expensive, crowded, and the hype is usually too much.